Many years ago, my dad and I needed to add to some damaged sheet metal roofing. To get a clean, not crumpled edge on the old metal roofing, my dad got this funny saw blade for a circular saw from the hardware store. The saw blade was just a round disk with notches cut into it, but no teeth, like the drawing at right. Unlikely as it looked, this blade cut the sheet metal roofing really cleanly. 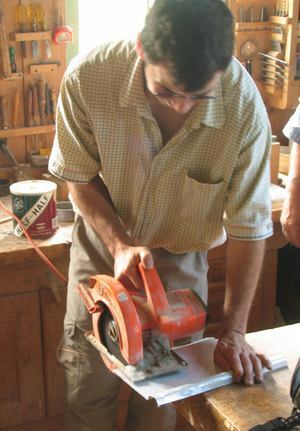 Years later, some roofers were putting some sheet metal on one of the buildings, and my dad showed them this saw blade. They had never seen anything like it, but were impressed with how it worked. The following year, they wanted to use that blade again, but we coudln't find it, so I decided to try making one out of a regular 7.25" saw blade. 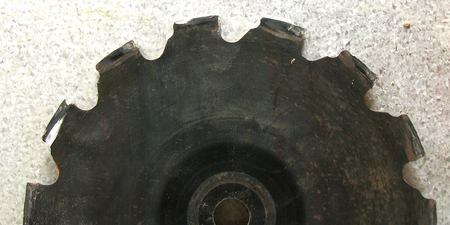 I started with a carbide saw blade that already had some of the teeth missing. I then pulverized the remaining carbide teeth with a hammer, and ground the teeth to be flat on top, and square. I had first tried to grind the carbide teeth off, but the carbide was way too hard to be ground away easily with the grinding wheel. 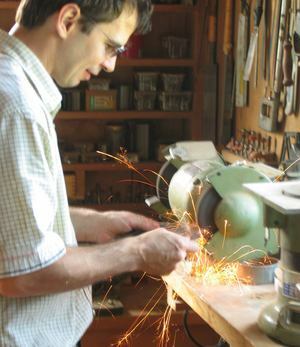 Even squaring out the notches in the steel blade made lots of sparks! When I tested it on some scraps of roofing, the resulting cuts were as clean as what the missing blade had produced, with hardly any sparks when cutting. I think the blade works by just shearing out bits of metal (there was sand like chunks of metal produced). 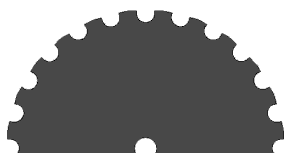 Of course, instead of this, you could just put an abrasive cutting metal disk into the circular saw, but using an abrasive disk leaves a big sharp burr, heats up the metal, and produces lots of hot sparks, whereas this blade left the edges clean with no sharp burrs.